Discomfort is a necessary part of change. No matter what your ultimate goal is, you can never reach it if you live inside the confines of your comfort zone. 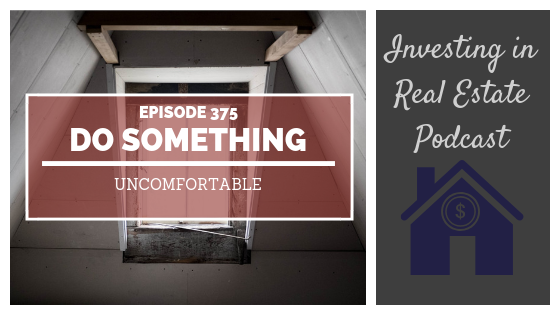 On today’s episode of Investing in Real Estate, I’m talking about the importance of mindset, and why it’s important to make yourself uncomfortable. You’ll learn how discomfort relates to building wealth, and I’m sharing a challenge you can use to cultivate growth in your life. Don’t miss episode 375! Why you should push the boundaries in your life. How to identify the things that make you most uncomfortable. The link between discomfort and growth. How to change your mindset about money. Why switching up your routine is so important.